This article was originally published on my WordPress blog – April 2014. 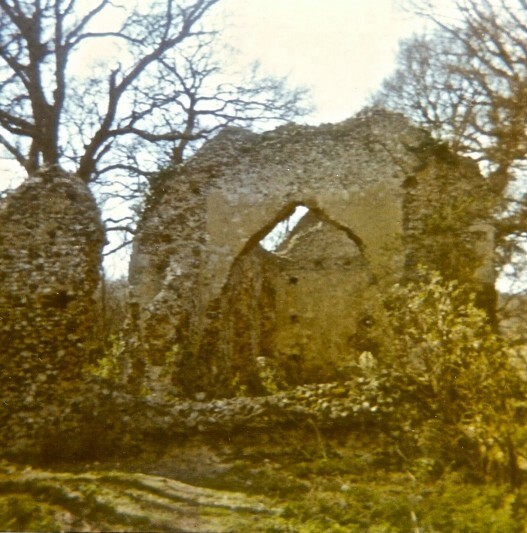 Minsden Chapel in 1973 – a rather out-of-focus photograph taken with my old Instamatic camera. The ‘what is the use of it?’ question was addressed to the historian Reginald Hine ‘by a fellow-townsman as I sauntered beside him through the streets of Hitchin with a fragment of this History underneath my arm’. The ‘History’ to which Hine referred was his magnificent two volume History of Hitchin, published in 1927 and 1929 (1). Hitchin, in North Hertfordshire, is about 30 miles north of London. It originated in the Anglo-Saxon era as the home of a tribe called the Hicce (to rhyme with ‘itchy’, and yes, I’ve probably heard all the jokes) (2). It was a royal manor by the time of the Norman Conquest in 1066, and developed into a small market town, like thousands of others across England. Hitchin played a big part in my life – I was born there, grew up in Preston, a small village just outside, and attended the Boys Grammar School in the town. ‘It is only by the publication of such local records that we can get a general view of what the history of the nation has been – I mean the real history of the people as distinguished from the doings of kings and parliaments and armies and navies’ (3). Many years later, W G Hoskins, founder of the groundbreaking Department of English Local History at Leicester, would write of Hine’s work as ‘first-class’ (4). As Richard Whitmore’s engaging biography makes clear, Hine himself was a complex man with some strange ideas (5). He became obsessed with a small ruined medieval chapel at Minsden, a mile or so from my home village. He took on the guardianship of the chapel and even wrote that he would offer supernatural protection to its walls after his death. As a cursory googling of the term ‘Minsden Chapel’ shows, a ghost legend has grown up around Minsden, helped not a little by the photograph of a ghostly robed monk standing in the ruins, which Hine published in Volume 2 of his History. The photo was taken in 1907 by Hine’s friend T W Latchmore, a noted professional photographer (6). Apparently, Latchmore later admitted that the ‘ghost’ was a hoax, the fruit of an experiment with double exposure, and there is a strong suspicion that the robed ‘monk’ was none other than Hine. Tragically, Hine’s life ended in suicide, under the wheels of a train at Hitchin Station in 1949. His ashes were scattered at Minsden. I was fascinated by Minsden Chapel from an early age. My village primary school had a copy of the History of Hitchin and as children we used to take wondering peeks at the picture of the Minsden Ghost. I remember an adult laughingly telling me that Minsden was haunted by the ghost of Reginald Hine, so the story of his posthumous commitment to the place was evidently well known by the early 1960s. However, it wasn’t just the ghost story that impressed itself on me. Hine showed that it was possible to find out what things were like in the past, and that this could be an interesting thing to do. These simple childhood lessons impressed themselves on me, and are probably at the root of why I became a historian. A lot of people would quarrel with his third point: aside from anything else, the word ‘pageant’ conjurs up faded photos of 1920s people (badly) dressed up as Saxons and Normans, history at its cheesiest. Personally, I think that in a lot of ways history can help us to understand the present, even if only to make clear the extent of change. Still, that’s just my opinion. Hine delivered a salutary warning about historians, though in this case he meant the Big Names of the history world (Thucydides, Gibbon, et al. ): ‘let no one be misled by the pronouncements of the historians: for when they pass judgment on History they do but pass judgment on themselves’ (7). By this he meant that they looked coldly on the people of the past, and projected their own concerns on to it. So that’s us historians told. To Hine’s three reasons I would add a fourth: by studying history and writing about it well, you can inspire others to look at the past. That is my debt to Reginald Hine, and I offer my thanks to the smiling ghost of Minsden Chapel, whether he is real or not. (1) Reginald Hine, The History of Hitchin, 2 vols., Hitchin 1927 and 1929 (republished by Eric T Moore, Hitchin, 1972). (2) I Friel, ‘The regio of the Hicce’, Hertfordshire’s Past, Autumn 1982, pp. 2-13. (3) Quoted in Eric T Moore, Hine’s History of Hitchin. Proposals for a Reprint, Hitchin 1972, p. 3. (4) W G Hoskins, Local History in England, 2nd edition, London 1972, p 6. (5) Richard Whitmore, The Ghosts of Reginald Hine: An Uncommon Attorney, Hitchin 2007. (6) History of Hitchin, Vol 2, facing p 39. (7) History of Hitchin, Vol 2, pp 437-41.